Starting from CentOS 7, you will not see a package called mysql-server in the yum repository. Now the package is called as mariadb-server. The original MySQL is now owned by Oracle corporation. But MariaDB is a fork of the original MySQL database. 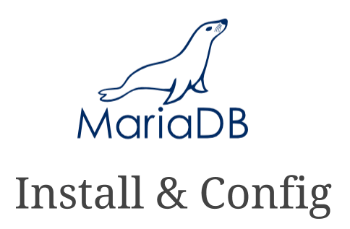 Just like the original MySQL, MariaDB is also open source, developed by open source community, maintained and supported by MariaDB corporation. From our point of view, only the package name is changed. MariaDB is still MySQL, and all the mysql command line utilities are still exactly named the same including the command called mysql. This tutorial explains step-by-step on how to install and configure MariaDB on CentOS or RedHat based Linux distros. mariadb-5.5.52-1.el7.x86_64 -This contains several MySQL client programs and utilities. mariadb-server-5.5.52-1.el7.x86_64 – This is the main MariaDB MySQL database server. mariadb-libs-5.5.52-1.el7.x86_64 – This contains the shared libraries that are required for client program interface. The current version of MariaDB-server that is available on CentOS 7 yum repository is 5.5.52 as shown below. Install the MariaDB MySQL server package as shown below using yum install. In this case, on this server, it has installed mariadb-server along with the following dependent packages. Verify to make sure this has installed the three important MariaDB mysql packages. As you see below, mariadb database server module is loaded, but not started yet. Start the MariaDB mysql server using systemctl as shown below. Verify the systemctl status to make sure the mariadb database server is started successfully. Jun 26 18:26:32 deploy mariadb-prepare-db-dir: The latest information about MariaDB is available at http://mariadb.org/. Jun 26 18:26:32 deploy mariadb-prepare-db-dir: Corporation Ab. You can contact us about this at sales@mariadb.com. Jun 26 18:26:32 deploy mysqld_safe: 170601 18:26:32 mysqld_safe Logging to '/var/log/mariadb/mariadb.log'. Jun 26 18:26:35 deploy systemd: Started MariaDB database server. Use the mysql command as shown below to connect to the database using mysql’s root user. The following show database command will display the default mysql databases. As you see from above, by default, the installation doesn’t assign any password to MySQL root account. To set the mysql root user password and perform other security configuration on the database, execute the mysql_secure_installation script as shown below. Since this is the first time we are running this script, there is no password assigned for the mysql root account. So, press enter here. At this stage, say “y” to assign a password for the MySQL root account. Enter the password after that. Please note that this mysql root account is different than the linux root account. So, here we are setting the password for the mysql root account, which has nothing to do with Linux root account. As part of the default installation, mysql installs anonymous user who can login to the database without a real user. So, we should really remove this user. As you can imagine, mysql root account will have access to all mysql database. So, it is important to keep this secure. Also, we should make sure remote clients from other servers are not allowed to connect using this mysql root account. Instead, only the localhost (where the mysql server is installed) can connect using root account. So, we should really disallow root login remotely. This is the default test database, which we should be removed. Type y here to make sure all the changes we did so far will take into effect immediately. Now, if you connect to Mysql without a root password you’ll get the following access denied error message. To specify the password, use the -p option as shown below. This will prompt the user to enter the password. Also, as you see below from the show databases command, the test database is now removed. If you want to pass the password in the mysql command line, specify it right next to -p option as shown below. Note: There is no space between -p and the password. This might cause some confusion, as we have space between -u and username. But, there is no space between -p and password. How can I configure database location , because when I install the database, I can’t configure where the database will be installed..